The notice reads: "Terrace Banks: Constant foot traffic is causing long term damage to the banks. Not climbing them will help preserve them and the wild life and flowers that survive here. Thank you". The gardens are grade II* listed Link . 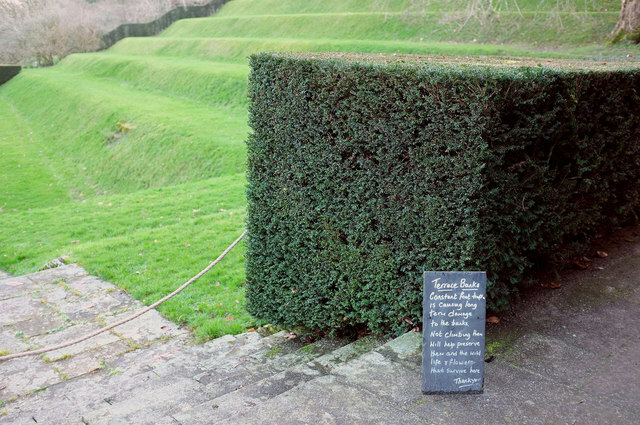 "Archaeological evidence suggests that the terraces enclosing the Tiltyard were constructed in the C16 or C17 (Currie, 1993), although it never actually function as a tiltyard."